With the recent discussions around the importance of support staff like coaches and analyst, the concept of sports psychology has been somewhat overlooked. Teams may have the individual skill, strategic depth, and synergy in game, but if nothing else, the NA playoffs has demonstrated the undeniable importance of mental fortitude and organizational support as key metrics in team’s success. 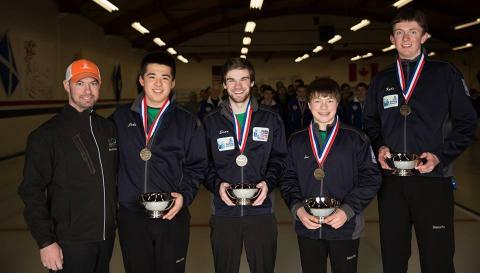 Recently, I spoke with Evan McCauley who is a National Curling Champion that competed in the World Championships in Switzerland earlier this year. He is also an avid fan of the League of Legends competitive scene and is finishing up his degree in sports psychology, hoping to break into the e-sports industry. He brings the insight of a competitor in a strategic, team-based sport as well as his knowledge of psychology and its relevance to the League of Legends competitive scene. I know you as Evan McCauley, the guy who went to the Curling World Championships in Switzerland this year. You're currently working, getting a degree in sports psychology, and coaching curling in your spare time. Starting with your background a little, when did you start curling? When I was like 10. Two of the people on my team come from curling families and their dads were national champions, so they almost started as infants. My dad saw it on the Olympics, when I was like 8. He started then and I followed a year after. The rocks weigh like 42 lbs., so it was a little funny when I started. Over time I grew to love the sport and started pursuing it more competitively. I have gotten loads of support from my family and extended family, which made it a lot easier. Fast forwarding to the World Championships, what was it like qualifying for, and competing at an international tournament in Switzerland? That was...I don't know if I was expecting to happen like that. We were having issues the entire year with a really negative coach. Jake, my older teammate and I were really close at a certain point were actually quitting competitive curling because the feeling in the team wasn't fun at all, and even got worse than a job. A little less than a month before the national championships, we changed our coach, and it goes to show how important positive influence can affect you. We were all good curlers, but never thought we were because we were stuck in this mindset and atmosphere. It had gotten as bad as accusations of fixing stats targeted at certain players, and was a lot of drama involved for what we got out of it. Also, a curling team is small, about 4-5 people. For us, the coach is another teammate almost like Korean League of Legends team is actually 10 members where the mindset here is that the team has 5 players and all the support staff are considered extraneous. This coach turned us from a team who were hoping to make the final 4 in the United States to winning the gold medal match convincingly. So what were your expectations in going to the world championships? I...had a lot of trust in my team and my ability, and knew that if we played our games to the best, there was no team on the face of the planet that could beat us. That's sort of how you have to think when going into these things. These three guys on the ice with me, I believe that we have the potential to win. Even if we get behind, I know that we can come back. In many League of Legends matches or Bo5 series, players seem dejected after losses and it affects their game moving forward. Whereas on this team, I always felt that we were always able to look ahead with the confidence that we could pull it out. I saw some of the results were really close? You have no idea. The Norway and Sweden games were on the same day, that we lost by a point each, and I think they even made the final four. We got blown out by Canada because by that point we couldn't have made the finals and didn't have much of a stake in the game, but those other two we would've won with an inch here, but we definitely would've beaten them [Canada] otherwise. Not knowing much about curling, can you go into some of the strategy involved? Does everyone play their own game, or is it more team-based and reactive to the opponent's play? The strategy in curling is mind-boggling, from basic fundamentals to crazy mind games. For example, reading the ice is very important. Taking a shot in one zone of the ice is different coming at it from a different side. Some players prefer to a side for taking their shots, and so if I let them take difficult shots from the side they prefer, causing them to miss, it's going to lower their confidence in that shot or make them play differently to our advantage for the rest of the game. We actually did that a lot during Nationals. We played a team in the round robin stage, and again in the tournament. The first game, we made their team captain go on tilt, by playing so aggressively during the second half that they didn't know how to react. When we played them again, they were still trying to figure out our game and we were able to use that to our advantage. I saw that you've been a curling instructor in your spare time, what does that entail? It's kind of a place where beginners or intermediate players come to learn the sport, and I help guiding them through the fundamentals and see them enjoy it for the first time. Also, since curling is a Scottish sport, every club is connected to a bar where people can socialize afterwards. For me, after all the competitive curling I do, trying my best, analyzing the games afterwards and talking strategy, it's fun to go back and help be a part of what started that and made it fun for me. Last non-League related question about you, what are your future plans? I'm not sure what the future holds, but I would love to be involved as a sports psychologist for e-sports, specifically League. With my background in curling and small team dynamics, and positive energy/high pressure situations is my specialty that it seems like a perfect fit for me. At the same time, I could go into most traditional sports or even research, I'm pretty interested in most facets of sports psychology, but e-sports would be the dream. Going back to more general discussion, can you generally explain what a sports psychologist does for a team? So, there are a lot of things sports psychologist can do, from talking to individual players through struggles, issues or doubts. But anything from team dynamics, how players are interacting inside and outside the game. How the coach handles things and dishes criticisms. All those interpersonal interactions are delicate and where a lot of sports psychologists can help with. Building off that, a lot of people involved in the competitive scene and the support staffs are either players or famous members from the community. Can you compare specifics of your experience and how you can use it to help facets of competitive League? So, specifically dealing with teams is huge. You will see teammates get into arguments a lot that most people probably will never see. The arguments that are shown seem like issues that are brought open in a team forum. I've learned that 1-on-1s are the most useful way to get ideas and information across. These teams are under tremendous pressure, and opening up issues could lead to emotionally charged fights instead of constructive forums. Especially since a lot of players who don't understand the psychology of team dynamics, they aren't going to phrase their criticisms diplomatically causing more problems. These are issues that are universal to sports, and people don't necessarily need a large amount of in-depth game knowledge to resolve these issues. Any member with coaching experience in any sport can help with them within a certain context. Do you think all competitive League of Legends teams in the LCS need a sports psychologist and how do you go about determining which ones do? I think every team could benefit from it. There are teams that may need it less. I can't say specifically because I'm not there to personally witness the inner workings of the team, but if a team has a strong emotional role model, it's less necessary. For example I think Hai seems like one that fits this description. He handles explosive situations very well and there was one time between games where they lost and were dejected, Hai comes in and says to not focus on the negative and just prepare for the next game. That was really great, and I'm sure players like Krepo and Snoopeh also have great mental states, but can't speculate on how well they transfer that to their teammates. But there are problems with having the emotional team member in the team. Nien was a perfect example of a positive emotional team member. If you remember the third game in the CLG-TSM playoffs where he broke down; that's a case where your emotional leader is a player and he needs support too. When I was curling, I played that role for my team but sometimes you think as a player and can't fulfill that role for your team. I sometimes needed that support, and I feel that CLG needed that during the game. When we hired the new coach, he was able to do that for me and fix my shooting percentage. He helped us with confidence, willingness to make plays etc. A lot of coaches in the scene try to do that, but I don't know if they have the training or knowledge to create that positive environment. Right now, a lot of sports psychology in e-sports is a luxury. Some teams are still struggling to hire an adequate coach or analyst. Do you think that hierarchy of support staff is correct with analyst/coach followed by psychologist or do you think some teams would benefit more from the latter? I think a sports psychologist could bring more to certain teams. If you've got someone on the team that is already strategically and mechanically sound through the strengths of their players, could simply just be having issues with how they approach the game or what they think about their teammates. It's frustrating because I wish I could see more of the LCS teams' dynamics first hand to gauge the interactions between the various members: players, coaches, analysts, managers, etc to base my hypothesis on. And, while I don't understand the strategic nuances of team play, a lot of people empirically link team's improvements to their analysts. But I do think that especially when the team is young, a sports psychologist could serve an important role in bringing the talented roster together and create the proper synergy before introducing them to a level of strategic depth. For example, if you consider a lot of great western teams, CLG EU , Moscow 5, Cloud 9, etc, you see a trend that they were comfortable with each other first, and that allowed them to become great because they had a basis for trust, whether it was common language, shared determination, or just friendship. If you have that level of faith in your teammates’ abilities and dedication, it allows your team to shake off defeats, embrace new ideas, and adapt more efficiently as a unit, and that's something a sports psychologist can help teams develop. Some people would argue that while this level of friendship and social synergy has successfully translated to teamwork and performance, it's not necessarily the only catalyst in developing a good team and coaches/analysts can provide the proper direction to make up for it. Can you comment on this argument? I can see that point of view, but there's a range of acceptable emotions team members can have for one another and still succeed. But if a player is harboring a grudge, or if two players just despise each other, I would argue that the team is not going to perform as efficiently at the highest level. Competitive League is still somewhat underdeveloped and so it is possible for an analyst to take the five best players in the world to victory despite them disliking one another. However, this requires the team members to be extremely introspective and objective with how they talk about the game and critique without taking it personally. This actually makes the case for sports psychologists even stronger, because they can help set up and facilitate this objective communication channels for those members that choose to be personally and emotionally detached from the team. Roster changes, building team synergy, overcoming LAN jitters, dealing with losses, and negative community interaction. Getting back to teams, roster moves during and between seasons has been quite common this year. Do you think sports psychologists can play a role in helping teams draft a new player, via interviews or conversations to determine if he would be a good investment, because currently the process is subject to the whims of the players or the organization that don't necessarily see player's viability from a mental perspective. Yeah, there are several things sports psychologists can do with changing rosters. As you mentioned, the first thing is vetting the player based on their emotional and mental strength and that stuff. But these are also traits that can be learned, and that's almost more important. Having a sports psychologist can take a young player with great potential and help instill the proper mindset. For example, if I were a sports psychologist on a team that just hired a young, inexperienced player, I would work really closely with him and help instill a positive attitude, talk him through expectations, and help him translating the raw potential the team saw onto the stage. Coming from solo queue, players sometimes try too hard to make plays and when the team loses, they are probably blaming themselves for their loss. Understanding how to credit victories and handle defeats as a team and unit takes time, and I think newly drafted players struggle mentally with that. The opposite problem some new players have is lack of belief in their team, and mentally shift blame to specific members, creating a huge barrier between communication and teamwork. Instead of blaming themselves or others, I would teach them how to be a part of the team and help them communicate with the team about how they approach the game and what they need to succeed, and try to find a balance between individual and team needs. I firmly believe that trust between players is the most important thing to succeed at the highest level. Some players seem to struggle translating their solo queue or scrim performances to live events. Pobelter and Link are two examples of players that were extremely hyped before their introduction into the scene as being incredibly strong mechanical players, and while they've demonstrated instances of brilliance, they don't have the consistency of players like Bjergsen and Rekkles who seem to thrive in the spotlight. What do you think needs to happen for these players to resolve this issue? Is it one overarching problem that applies to everyone, or do you think it's specific to each player? There are a few reasons that cause that lack of consistency during high pressure events. The first could be belief in yourself, and fixing that really varies per person. If we consider depression, there's a range of people and how they respond. Some people can be cheered up while others; you can only help get them through the rough times. Similarly, it's about showing players that being a good player and playing well are not necessarily connected. Players that dwell on negative performances slowly change how they feel about themselves, shaking their confidence and causing them to play poorly, further reinforcing the idea. Another reason is less based on the player and more on the team. Some teams misuse the talent on their team by transferring resources to other lanes and members, and players that rely on these resources to do well may not have the strategic understanding of how to alter their game to optimize for the team's needs. For example, if a super mechanically proficient player is brought in to play a position, but farm is funneled into other lanes, or the jungle uses his presence to pressure other parts of the map, the player may not have the decision-making skills to know the best way to proceed in that context, and his performance may look lackluster compared to his potential. Dealing with losses in both the short term [Bo5 series, tournaments etc] and the long term [over the season] takes a lot of resilience and mental fortitude. From your experience or studies or experience, how do you think this can be improved in the scene? I actually have a great personal example for this. We were in this curling tournament where we were against North Dakota, which was maybe the 4th or 5th seed at the time. We went in so confidently, expecting to crush them, but get absolutely demolished. It was really jarring, especially considering that we were going to play the top seeds the next day. In that situation, the team needs to maintain confidence in order to maintain belief in their team. Depends on the time between games, the team needs to either learn from their mistakes and adapt, when they have a week for their next game, or they need to ignore and shake off the defeat as a fluke, and maintain composure for the short term. In both cases, the team should go into the next game with the belief that they will still win, either because they adapted and improved since the last game, or simply because they know they are better. This is made especially difficult under high pressure situations or under the weight of expectations, and it helps to have someone outside the team, coach/psychologist that the team can rely on to talk them through it and maintain a positive attitude. From a psychological perspective, what do you think of the level of interaction between the community and the professional players, and what would you do to address it? Oh god...I love how close the pros are with the community...but our community is pretty terrible because there's so much pointless, poorly phrased negativity based on assumptions that are speculative at best. There are multiple approaches players can take, the first is Locodoco's approach where players isolate themselves from social media after losses, or completely. An alternative idea is to develop a thicker skin, modeled after many athletes and celebrities, where they consider themselves so detached from the community that they can look at criticisms without feeling the need to address it. It's also situational depending on the person, but some players and members in the community are so tied to social media for support, that when that support turns into negativity and critique, it's difficult to handle. The recurring theme in this conversation seems to be that teams and its members need to believe in each other in order to achieve the highest level of competitive success? From all my experiences and studies, I do strongly believe that everyone on the team needs to trust that their team members are going to be at their best and are doing everything in their power to strive towards that goal. As cheesy as it sounds, and I know I've stressed it multiple times already, trust is extremely important. A team that has these qualities is most likely going to sustain through difficult times, because the knowledge that they did the best they could and will continue to keep going is the biggest strength for a team's mental fortitude. I wanted to thank Evan McCauley for taking the time to speak with me. His experience as a national curling champion and knowledge of sports psychology brought a great deal of insightful depth to the discussion, which highlighted countless and extremely relevant ways that principles of sports psychology can help make a positive impact for professional e-sports teams. With the current growth in coaching and analyst infrastructure in the western League of Legends scene, hopefully teams will also consider the addition of sports psychologists to the support staff, even temporarily will have a positive impact on the mental fortitude of the team. In a previous article, I argued against recently retired players being elevated to the position of coach/analyst/manager etc, because there are internal feelings of inadequacy that complement the decision to retire. In addition, these retired players are probably not older or more mature, so the team members, community, or even internally, it's hard to make the switch from the mindset of a peer to a different role. Am I missing something? I agree with you if we're posing this as a hypothetical and the supply and demand of support staff is at equilibrium, because the effectiveness of the staff is directly proportional to the respect the players on the team give the staff. But otherwise, I think it would be logistically very difficult for a player to retire and gain the adequate experience and maturity before trying to break back into the scene. It makes sense for that player to join the staff immediately and slowly work towards developing those. Also, it helps that there are successful models like Scarra to look up to. Building off that, Scarra is a very intelligent person. I remember interviews from a few years ago where Scarra talked about the development of the competitive scene and Riot's role in it etc. He has this intuition that's rarely found in other players. If a team doesn't have the adequate funding to invest in a proper support staff, a good coach can actually fulfill most of the responsibilities of a sports psychologist. Do you think that these skills require professional training/experience or can they come intuitively to people? I definitely think they can come intuitively. When I was on the curling team, I tried to fill that role on my team. The funny thing was, I used to be a very headstrong player and used to get very down on myself for doing poorly. But over time I realized that, everyone on my team must feel this at some point and like me would be underperforming because they had no one to help them. So I decided to take what I felt in my weakest moments and learn from that to help my teammates overcome their struggles. I slowly became a positive player and it transferred to a lot of players on my team. So in the same way, I think someone can definitely acquire these skills and learn how to deal with the team, and right now that's going to have to be enough for the competitive scene. Unless an organization is actively seeking a sports psychologist, there's no way for someone like me to break into the scene. More funding will allow teams to diversify their support staff, but until then smart coaches, analysts, or even managers can try to fill this role for the team. Another reason I see the importance of sports psychologists in e-sports is that the industry is still growing and changing. In other sports, a student can have reasonable expectations for what to expect, or ask his family or other sources for support. In e-sports, most of the players start off as kids, and don't really know what to expect, sometimes dealing with a lot of social pressure due to their decision. What do you think organizations and Riot can do mitigate some of these issues? Obviously, the biggest thing Riot could do is bring more money into the scene. Financial stability definitely helps for aspiring players to argue their case. I agree that the uncharted territory makes it harder for a lot of players, and why I respect the dedication a lot of players put into pursuing it, because there is so much that affects game performance that the spectators just can't understand. Sports psychologists can definitely help players come to terms with their decisions and help ease a lot of the social pressures surrounding the scene, and again with more money, organizations should definitely look into investing. A major part of the issue is also that the majority of players join the competitive scene at the age where they should be focusing on education, and that's awkward for both players and their families. Upcoming article on strengthening ties between Riot and universities: A lot of other sports have presence at universities and allows players to do both, so Riot could try to strengthen their relationships with universities and help with transitioning ex-professional players to higher education or creating a more legitimate university league where players can join and compete so they aren't stifled by the choice. The person in curling relaying the strategy during the game is called the skip or captain. He's not necessarily the most strategically apt player on the team. Strategy is something that should be decided by the team before the game. The skip is actually the tactician, who can translate the strategy in high-pressure situations or intuitively feel the game and guide his team by doing what he considers the best option. In the same way that players can misplay mechanically, it's possible for the tactician to make a mistake, but those should always be addressed after the game. Insights like this are ingrained in a lot of other sports that would greatly help a lot of competitive LoL teams. I see your distinction, but I would argue that League is not a game where you can prepare for contingencies, so it would make sense that the person who has the primary strategic knowledge to also make the calls in game because he can understand the context and nuances of particular strategies. I think you misunderstood, I'm not necessarily saying that the strategist and tactician need to be different people, just that deciding the overall strategy should be a team effort, and the tactician should be chosen by the team who can best translate the strategy. If something goes wrong in the game, the team gets together in the end and shares the blame and re-evaluates their strategy, and not place unnecessary strain on the tactician. If you suddenly blame primary shot caller on the team for your loss, there is a trust that's broken that leads to a lot of teams imploding. Trust is the most important thing for a team to have.